The Badgers opened Big Ten play shaking off the hangover from the poor officiated game last week handling Purdue in methodical fashion. It was a decisive response from what had to be a frustrating week dealing with the aftermath of the Arizona State game. It was nice to get back to deciding games on the field instead of analyzing screen shots of Stave's knee and highlighting the rule book. Without further ado, the week 4 Buckys! Badgers running game has been nearly unstoppable this year. James White and Melvin Gordon are caught up in an exciting game of ‘anything you can do I can do better’ which has been a treat to watch for Badger fans, and misery for opponents. Currently the Badgers have three running backs in the top 40 for rushing yards Gordon(1), White(10) and Corey Clement (36). 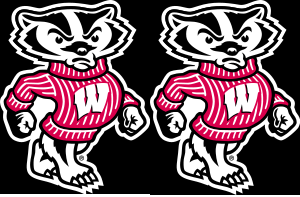 Additionally it seems the Badgers are finding ways to get White and Gordon on the field at the same time more often putting even more pressure on defenses. While the rush yards are likely to come a little bit harder in Big Ten play, the Badgers running back traditional is alive and well. Joel Stave remains inconsistent. For whatever reason he has lost accuracy on his deep throws and has yet to shake off the habit of staring down receivers. Stave will need to be better in order to win at Ohio State this week and come up with two or three big throws to sustain drives or connect on long touchdown pass to swing momentum. As good as the running game has been, Ohio State’s defense will be good enough to shut it down if the offense becomes one dimensional. One week after struggling big time to shut down the high octane Sun Devil offense, the Badger defense came out and reestablished themselves against Purdue. The Boilermakers came into the game averaging 272 yards of total offense per game, not a juggernaut but any stretch of the imagination, yet the Badgers held them to 180 yards total and just 3.1 yards per play. Sophomore(or hopefully redshirt freshman if his application ever gets approved from the Big Ten) Vince Biegel started at linebacker and was extremely disruptive in the Purdue backfield. True freshman Sojourn Shelton continued his excellent play adding another interception and is really developing into a top flight lock down corner. Another big road test for the Badgers and getting a win over the 4th ranked Buckeyes in Columbus would go a long way to forget the shenanigans that lead to a loss on their last road trip this season. Much like the Badgers, Ohio State has started out the year with an unimpressive non-conference slate. Unlike the Badgers they won their Pac12 road game against California. The biggest question facing the Buckeyes this week is who will start at quarterback? Kenny Guiton has started the past two games for preseason Heisman hopefully Braxton Miller, but most accounts indicate Miller will be healthy enough to play Saturday against the Badgers. The good news is Badger DC Dave Aranda should have enough film on Guiton in the 2+ games he's played to have a plan of attack for either QB. The key to both will be slowing down the read option. Urban Meyer's offense is predicated on getting fast athletes in space to make plays. The front seven has been stout against the run so far and the overall team defensive speed is improved compared to years past. This years defense has the pieces to slow down the Buckeyes offense but it will definitely be the biggest challenge they’ll face all year. Offensively the Badgers need to find a way to be productive in the passing game. One dimensional offense will not cut it against Ohio State. Look for offensive coordinator Andy Ludwig to work the short to intermediate passing game early via screens and play action to build Stave’s confidence. Running between the tackles will be a challenge this week so anyway to get the ball into the hands of playmakers Gordon, White and Jared Abbrederis attacking the edges of the defense will be huge. The Badgers quest to go to four straight Rose Bowls largely comes down to winning this game. Stealing a victory against a top five team on the road always requires a few breaks to go your way and this game might come down to a fake punt or other type gadget play to win. The Badgers have enough talent to compete but in the end the quarterback play is the difference.